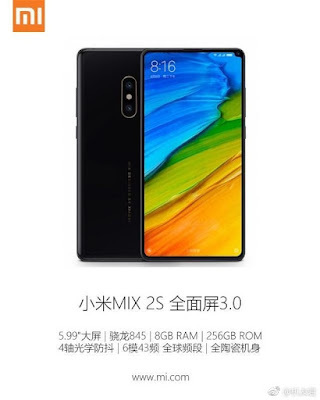 Xiaomi Mi Mix 2s will feature a 5.99-inch full screen 3.0 design sporting slimmer bezels than its predecessor Powered by Qualcomm Snapdragon 845 processor with 8GB of RAM and 256GB Storage. The Mi MIX 2S to come with an on-device artificial intelligence technology which may lead to features such as facial recognition somewhat similar to iPhone, four-sided ceramic unibody and an under display fingerprint sensor. The Mi MIX 2S will be using the new Sony IMX363 camera sensor that will be pegged with a dual-pixel autofocus technology. Mi MIX 2S shifts the front camera back to the top right corner. On the interesting feature that might attract the customer is its 12 MP optical zoom dual camera. Xiaomi Mi Mix 2 recently got a price drop in China. As of now, there is No details on Offical launch. Update: Mi Mix 2S will be powered by the Qualcomm Snapdragon 845 SoC Packed with a 3400 mAh battery. running Android 8.0 Oreo out of the box,18:9 aspect ratio with an FHD+(2260×1080) resolution.